You can observe the freezing of colloids yourself, if you take a walk in winter and have a look at the frozen mud, or make ice cream at home. The kind of observations we need is a tad more elaborated, though. We need to look in situ at the phenomenon, thereby requiring observations of both ice crystals and colloids trapped in between the crystals. Over the past years, I mostly focused on X-Rays imaging techniques, that is, X-Rays radiography and computed tomography. We observe and characterize in and ex situ the formation of structures by ice-templating and to establish the relationships between the composition of suspensions, process and porous morphology of frozen and sintered bodies. 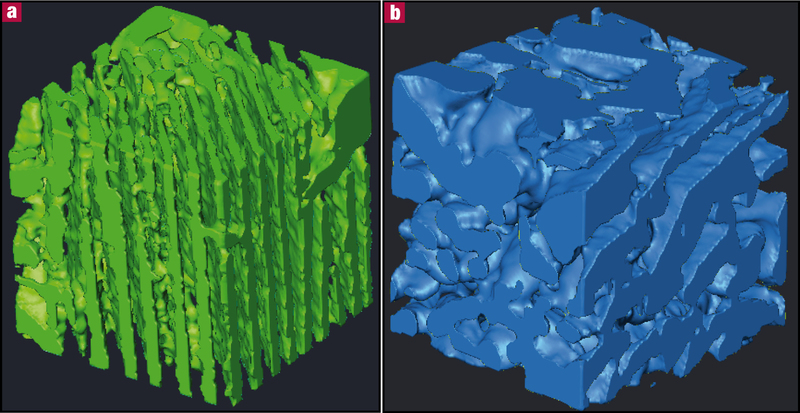 The combination of these techniques provided both qualitative and quantitative information about the propagation kinetic of the solid/liquid interface, the particle redistribution between the crystals and a particle-enriched phase, and the three-dimensional organization of the ice crystals. Most of the experiments were performed at the ID19 beamline at the ESRF, with some good friends from Lyon. Bareggi A, Maire E, Lasalle A, Deville S. Dynamics of the freezing front during the solidification of a colloidal alumina aqueous suspension: in situ x-ray radiography, tomography, and modeling. Journal of the American Ceramic Society 2011;vol 94-10, pages 3570–3578. Deville S, Maire E, Lasalle A, Bogner A, Gauthier C, Leloup J, Guizard C. Influence of particle size on ice nucleation and growth during the ice-templating process. Journal of the American Ceramic Society 2010;93:2507-2510. Deville S, Maire E, Bernard-Granger G, Lasalle A, Bogner A, Gauthier C, Leloup J, Guizard C. Metastable and unstable cellular solidification of colloidal suspensions. Nature Materials 2009;8:966-72. Deville S, Maire E, Lasalle A, Bogner A, Gauthier C, Leloup J, Guizard C. In situ x-ray radiography and tomography observations of the solidification of aqueous alumina particles suspensions. part ii: steady state. Journal of the American Ceramic Society 2009;92:2497-2503. Deville S, Maire E, Lasalle A, Bogner A, Gauthier C, Leloup J, Guizard C. In situ x-ray radiography and tomography observations of the solidification of aqueous alumina particle suspensions-part i: initial instants. Journal of the American Ceramic Society 2009;92:2489-2496. Deville, S., Adrien, J., Maire, E., Scheel, M., & Di Michiel, M. (2013). Time-lapse, three-dimensional in situ imaging of ice crystal growth in a colloidal silica suspension. Acta Materialia, 61(6), 2077-2086. Ice crystals are sensitive little guys, and sending them a synchrotron X-ray beam does not make them happy. We developed an alternative strategy based on confocal microscopy, which is a lot more simple, and extremely powerful. With this approach, we can image the time-lapse growth of ice crystals in 3D, and look at ice shaping effects, for instance. There’s just one paper out so far, but you can expect more soon. Marcellini, M., Noirjean, C., Dedovets, D., Maria, J., & Deville, S. (2016). Time-Lapse, in Situ Imaging of Ice Crystal Growth Using Confocal Microscopy. ACS omega, 1(5), 1019-1026.